The XDB_* role names have been corrected in 11.1.0.6 to match the documentation. 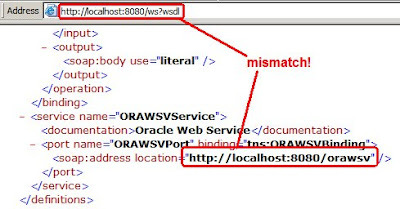 Confirmed that the auto-generated WSDL still assumes 'orawsv' as the URL pattern (see below). So for now, it's clear that you should stick with 'orawsv' as the servlet name and URL pattern for your native web services configuration.